Global artificial lift market was valued at USD 8.5 billion in 2017 and reached to USD 12.2 Billion by 2023. The market is witnessing significant growth owing to extensive demand for fossil fuels and escalating number of settled reserves that comprises of large amount of crude oil. Additionally, swelling production capabilities of shale gas and heavy oil is further driving the growth of artificial lift market globally. 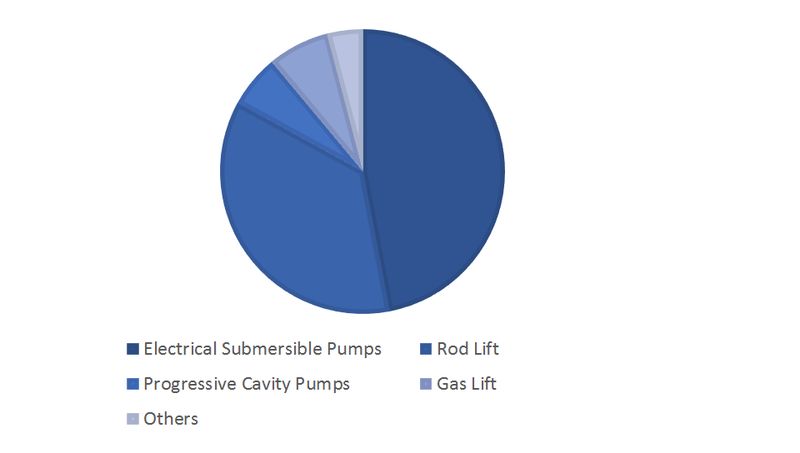 On the basis of type, the global artificial lift market is segmented into Rod Lift, Electric Submersible, Progressive Cavity Pumps, Gas Lift and Others types of artificial lift. Among all the types, rod lift is expected to witness the fastest growth, registering a CAGR 6.5% during the forecast period 2018–2023. The rapid growth of rod lift is contributed towards enhanced demand in U.S. and Canada for unconventional fabrication of oil and shale gas. Rod lifts are considered to be quiet economical and efficient alternative enabling manufacturers in developing consistency in several down hole equipment’s, which provides enhanced volume and higher deviations in production process thereby contributing towards the accelerating growth of global artificial lift market. The maturing oil and gas fields, accelerating deep-water or ultra-deep activities and depleting oil reservoirs are the major driving factors contributing towards the growth of global artificial lift market. Oil production is observed to be enhanced at a peak rate approximately in 35 countries including some of the major oil producers such as Kuwait and Russia. Moreover, artificial lifts enables the producer to have better control , optimizing unloading fluid process and performing various activities such as gas injection points without any hindrance and in an efficient manner. This flexibility in operations achieved by artificial lift is expected to help in fulfilling the future demand for oil and gas manipulation challenges by significantly decreasing gas-lift costs for subsea wells and deep water. All these factors are excessively enhancing the demand for artificial lift market across the globe. Application of artificial lift in horizontal wells is the major challenge for the growth of global artificial lift market. It has been observed that the artificial lifts are not significant for wells with substantial deviations from vertical wells. The placement of rod pumps and other artificial lift methods in strayed manner leads to several problems such as high exertion on the reservoir, deprived liquid lift proficiencies due to intrusion of gas in down-hole pumps and huge operating costs are some of the factors that hinder the growth of artificial lift market globally. Globally industry players in artificial lift market are leveraging new and innovative artificial lift technologies consolidated with new techniques and processes that enable its users to maximize production capabilities and reduce risk and thus assist shale operators to attain competitive edge. The providers are continuously implementing low cost effective lift systems and help the users in attaining optimum production capabilities to flourish in the existing artificial lift market. Geographically, North America is the largest artificial lift market as the region is observing pervasive demand for primary energy resources such as household activities, transportation and power generation is expanding the consumption of oil and gas in this region. This is persuading the manufacturers of oil and gas to meet this ever increasing demand and thereby dig deep, thus leading to accelerating demand for artificial lift in North America. Moreover, Asia Pacific is expected to witness fastest growth in artificial lift market during the forecast period 2017–2023. Countries in this region specifically China and India is estimated to swell the oil and gas demand that is expected to drive the demand for artificial lift market in this region. Due to increasing opportunities observed by oil and gas producers in artificial lift market and development of mature fields are encouraging the manufacturers to rapidly adopt this system and provide cost efficiency and steady performance to its customers. Market players in the artificial lift system are Baker Hughes, Schlumberger, Dover Corporation, Cameron International, Borets, Weatherford, GE Oil & Gas, Halliburton, John Crane, and National Oilwell Varco.